Synthetic Phonics lessons explicitly teach that the code is reversible; so if you can read something, you can also spell it! 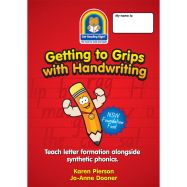 Now, Getting to Grips with Handwriting in NSW Foundation Font allows you to explicitly teach handwriting and make the connection to spelling. It mirrors The Synthetic Phonics Toolkit – Part 1 order, so as you teach children the phoneme, you can also teach them to form the letter in NSW Foundation Font! Please note this workbook may not be photocopied. It is for the use of one child only; you will need to order one copy per child.